A few weeks ago I remarked that the HP Mini-Note, like most laptops, gets rather warm when you place it on your lap. In fact, I think the Mini-Note gets hotter than pretty much any other computer I’ve used. Joanna Stern of Laptop Magazine agreed that the Mini-Note at least feels hotter than most laptops. But she decided that her first impression wasn’t good enough and so she went about conducting an actual honest to goodness test, with a thermometer and everything. The results? 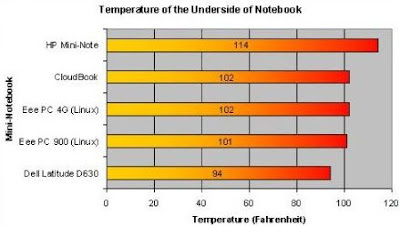 As you can see in the chart above, the Mini-Note gets hotter than any of the other PCs she tested. At least on the underside, which is the part you’ll most likely be putting on your lap. The results were a bit more mixed when she measured the temperatures of the keyboard and the touchpad. While the Mini-Note is certainly warm on top, it was by no means the warmest of the bunch. The Dell latitude D630, by the way, is not an ultraportable. And it consistently scored the coolest temperatures. So the moral of this lesson: Less surface area often means less ventilation. And that could lead to some sweat-worthy computing. It’s possible the reason the Mini-note is so warm on the outside is because it is cooler on the inside than some of these other laptops. It is the only one with an aluminum casing. Aluminum conducts heat very well. Plastic doesn’t. The heat you are feeling is heat that would otherwise have to rely exclusively on a fan to be evacuated from the inside. If so, this is good for the longevity of the internal components. Correct, you’d need to compare against a MacBook Pro or Air. Or a PowerBook 12″. Not that the Alu casing makes the laptop much cooler *inside*! Garamond’s comment about the aluminium casing is spot on – it makes the whole case a heat sink. Apple’s machines are well known for this effect. Using any so-called ‘laptop’ actually on your lap is actually an ergonomic nightmare – even more so with smaller machines like the HP 2133 and the Eee. All keyboard and screen work should really be taken with the device at the correct hand and eye height, and a lap does not provide that. But if you are wedded to lap computing at least with these smaller machines it is easier to find a book or other firm surface to rest it on when in lap mode – something difficult to do with a larger machine. The six-cell battery also helps with venting by raising the rear of the machine up off of whatever surface it’s sitting on.